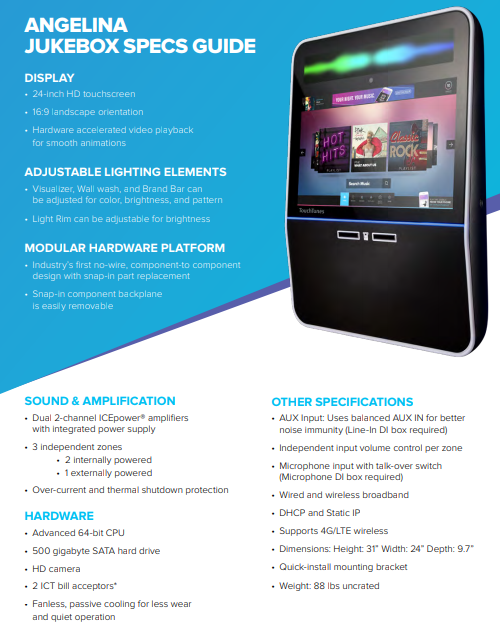 TouchTunes Angelina Jukebox - Lucky Coin Inc.
Music In A New Light-The Angelina defines a new standard for design, performance, serviceability and value, and creates a striking focal point for any venue. Engages And Inspires Like No Other-Sophisticated algorithms and state-of-the art lighting effects transform the jukebox experience and bring new textures to the rhythms and beats. Breakthrough Reliability and Ease of Service-Innovative no-wire, component-to-component design with snap-in part replacement, minimizes service times, reduces inventory needs and increases reliability and performance. If you are interested in working with Lucky Coin, you can contact us at info@luckycoininc.com, call us at 1-855-34-LUCKY.We provide the equipment, installation, maintenance, and exceptional 24/7 service FREE of charge, and you simply benefit from the added income! It’s a Win, Win!